Adam: Eddie, I understand that you live in the area of Yoshikazu Fujioka, in a suburb near Osaka and Kyoto. Over the years, I have read Yoshikauzu’s writing about “the Mountain Village” Can you tell me a little bit about this mountain village? Eddie: You are talking about Shirakawa-go village, are you? That village is just next to Takayama City, which you know in “Takayama Sakasa Kebari”. It is one of the world heritages in Japan and famous for its traditional style thatch-roofed folk houses. I visited there 15 years ago for the first time, and I keep visiting there once in a while. You cannot understand this, but tenkara is not so popular in Japan. You seldom see a tenkara fisher in my neighbor areas, but you can often see one in the peripheral region of that village. I guess that is because that region is one of the districts where traditional tenkara has been handed on. Anyway, that area is certainly one of my favorite fishing spots. There are mountain towns that I enjoy in the United States, particularly Colorado. One of my favorites is Silverton. As a young teenager, I used to travel to Silverton for snow surfing (snowboard). Back in those days, we were not allowed on the lifts and Silverton has deep snowfall each year. The road through Silverton is always cleared of snow and I would base myself there, taking the roads to the passes and park. I would then hike up the mountains with my board and make turns down the deep powder to the road below. As I grew older, I began to fly and Silverton had a hang gliding meet every year before the aerobatics meet in another town nearby, Telluride. I would participate in the hang gliding meet from Mt. Kendal above Silverton. We flew very high above the mountains and all around the area. We would land down in the town and it was quite a celebration. I love mountain towns, this is where people center their lives around the activities of the mountains. Although I am older now and past the prime of my youth, I still want to feel the energy of the community in the mountains. Through paragliding, I have injured my right knee and have had it repaired. Although I am still able to fly, as I grow older, the desire to fly is still there although the actual getting out and doing it becomes less and less. With tenkara, as I age, I am able to tap into the spirit of the mountains, hiking, backpacking, my adventures are still exciting, the objective dangers are different yet the pull of the mountain is still strong. Adam: I understand you also ski. Can you tell us about your other interests besides tenkara? Eddie: I think there are three big enjoyable fields for us outdoor people, Sea, Mountain, and Sky. I skied for long years, and I liked skiing in a deep fresh snow best. I often got out of a lodge early in the morning before other skiers make tracks in the fresh snow. However, I gave up ski about ten year ago, when I got my right knee injured for the second time. I still want to ski, but I fear that I would easily gets the same knee injured again when I skied, and that injury would prevent me from wading the streams and trekking the woods. Regarding the sea, I used to be a snorkeling skin diver and a yachtsman. I was able to dive more than 10 m deep, but I seldom swim today. Water is too cool to an oldster like me. Yachting was very fun, too. You can hear only the sound of wind and waves on a yacht, and you really feel as if you are a part of the nature. It is the same feeling as when you walk in the deep woods. Regarding the sky, I have never tried any sky sport, but I would like to try it if I had a chance. In addition, I like riding a bike, and I use it for commuting between my home and the nearby train station, just 4 km one way though. I sometimes enjoy riding a bit longer ride. I like to carry a camera with me when I do the things I love. Back in the old days before the Internet, I would often fix the camera on the wing of my hang glider or carry a Super 8 movie camera with me when I would go snowsurfing. I wanted to capture what it was that I was after. I didn’t share my photographs back then, they went into a photo album and I would pull it out now and then to place pictures in it or to dream about the things I did and what I wanted to do in the future. Now that I carry a digital camera, my photo books suffer. I rarely print out a digital image to place in my book, now the images get shared at a web site. Adam: I’ve noticed your photography is done in great style. Your pictures are composed like you have been doing this for a long time. The light, you capture it well. Have you been taking pictures very long and what do you like to see in the image? Eddie: I have not been into taking photographs very much. But to tell the truth, I had an experience of research and development of the camera technologies in a company I still work for. Through that experience I learned basic techniques of taking pictures, but I am not much of a good photographer. However, in our fishing club there are two really good photographers. Adam: I see. I am starting to work on “self portraits” in the outdoors. Because I enjoy the forest and tenkara without distraction, I find myself wanting to see myself in the images that I normally take of the landscape. For now, I will use a hiking pole, a telescopic Leki hiking pole and I will use a small tripod that has an option to keep folded (Ultra Pod) and velcro it around the handle. I will stick the pole into the ground with the mount on the handle and place the camera on a self timer and hope I get the shot I want. Adam: Have you done any self photography on your tenkara fishing? Eddie: I prefer pictures of a landscape including a person who has some relationship with that landscape. So, when I go fishing with friends, I usually take pictures with them fishing. But they do not take my picture on fishing. I have almost no picture of me fishing, and I had trouble finding my picture for this interview. I did not have a good tripod, and I hardly took my self-portrait. But I will try doing so, now that I got a good tripod. Adam: I’ve noticed that in my ventures in the mountains, moss is always present in my best places. Moss also seems to be present in the same areas in Japan, the best tenkara fishers have moss in the backgrounds of their images. I know this sounds weird but is there a lot of mossy places in Japan? Do you find a lot of moss around your best streams? Eddie: Not all streams have mossy places, but many streams have. Some streams have mossy place a bit away from the steam itself, and in some streams, the riverside rocks are all covered with moss. Japanese have long loved moss, and it is well incorporated in traditional Japanese style gardens. I like places where people do not normally travel to fish. Adam: In my area, I have two distinct fishing areas. The first is about 2 hours drive from my home and then some hiking. The first area is within a ponderosa forest. Most of the streams there are wild trout streams with some support from the Game & Fish agencies stoking fish trout here and there. Most of the time, I end up going for streams that contain wild fish and avoid the areas that are stocked. 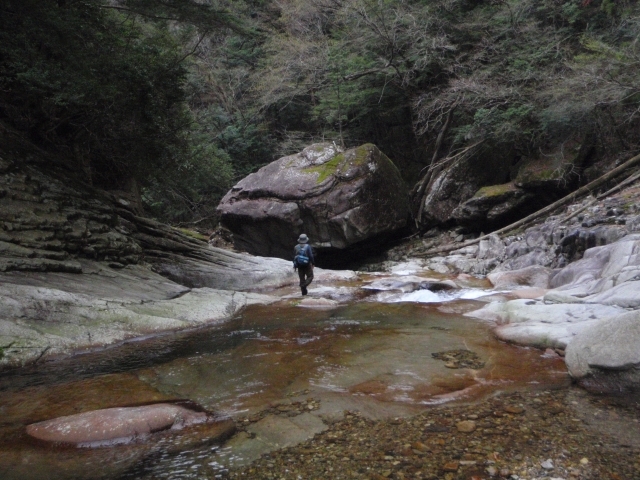 I often find myself hiking quite a distance in order to get to the section of a stream that is not overrun by get out of the car and fish type fishermen. Adam: Can you explain where your fishing areas are and a little bit about them? What kind of fish are found in your streams? Eddie: I often go fishing to two areas, Sendai River and Totsukawa River. Sendai River is about 2-3 hour drive from my home. Totsukawa River is about 3-4 hour drive. 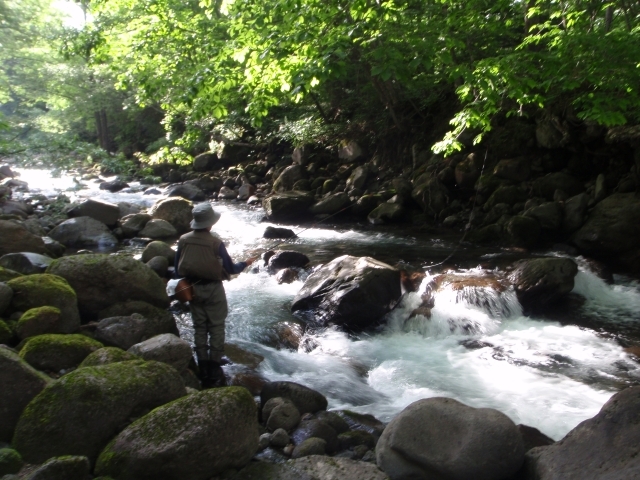 As for Sendai-river, the roads are so well built along many of the streams that you can easily get in the steams and go back to your car, and you can enjoy fishing without much physical effort. Accordingly, the streams are well fished, and you cannot catch many fish. In this river there used to be only yamame and iwana. But today, there are much more amago than yamame due to long years of stocking with amago. Amago were easier to cultivate than yamame. Too bad, many used-to-be yamame rivers are now yamame-and-amago rivers. 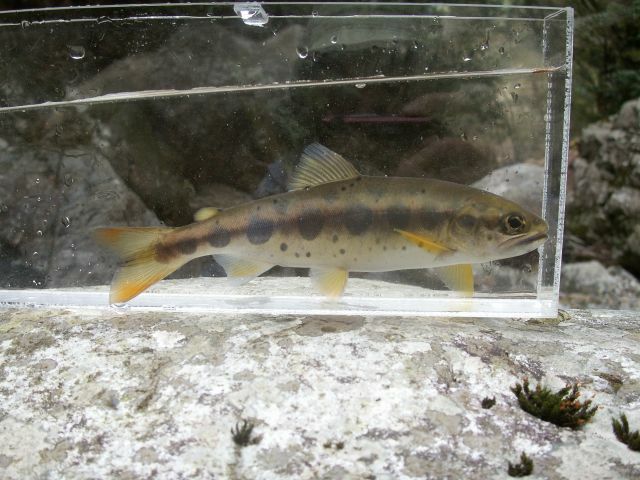 As for Totsukawa River, which is an amago river, there are many streams that do not have a road along them, therefore if you walk 1-2 hours from the car, you can get to the places that are not stocked and have many native amago. I prefer this Totsukawa River not because I expect many fish but because I can have an exhausting but enjoyable trekking in the forest. Adam: A small stream to me is one you can step across without much difficulty. What is a small stream to you? Eddie: Of course, I like a small stream, but for me, it is not a place where you enjoy yourself catching many fish, but a place where you can enjoy the nature surrounding it and you can see native fish. Fishing itself is more interesting in big streams than in small streams. Adam: I am also going to start photographing fish in a release box. Do you use a release box and if you do, can you show us any images from using it? Eddie: Many members of our tenkara club have release box, which we call just a tank, though. It actually helps to take a good picture of a fish, and I made a relatively small one for me. But to tell the truth, I have ever taken only a few pictures using it. It is small enough to put in the back pack, but it is a bit too fragile to carry in the backpack. Adam: For my small streams, I choose a 3.3m to a 4m rod. I enjoy fishing as long of a rod as I can. I am not targeting large fish although I enjoy catching the largest fish I can find in a stream, it is not necessary for me to catch all the largest fish. I like a braided tapered line because they seem to work for both dry and wet fly fishing which is what I do. I also like a level line. I have not been fishing tenkara enough to know what I really like. I’m just zeroing in on what works. Can you tell me what kind of equipment that you use and what you carry on a fishing trip to the mountain streams? Eddie: Regarding rods, I usually put two rods in the backpack. Both are 3.6m long. One is soft 5:5 and the other is a bit stiffer 6:4. I use the 5:5 rod with 2.4m, 3.6m, and 4.8m taper lines, and the 6:4 rod with 6m and longer taper line. As for lines, I use furled taper lines. The reason why I use the taper line is that you can easily see where it is and casting is a bit easier with a taper line. The level line is difficult to see where it is, and a self-made taper line gives me the satisfaction of using my own line. My taper line is not so heavy, its thickest portion is made of three 10lb fluorocarbon lines. If you want a lighter taper line, you can use thinner fluorocarbon lines. Other than fishing tackles, I carry usual things: a map, compass, water bottle, lunch, digital camera, rain wear, and flash light. I sometimes carry a stove for cooking lunch or wasabi (horse radish) for sashimi. Adam: I understand you have a friend that is a consultant to the manufactures for rods, lines and things. That is cool. I hope that we can introduce his goods to America and the world. Is there anything else out there in the future of tenkara as far as equipment goes? Eddie: I know that new technologies such as carbon fiber and fluorocarbon have changed tenkara technique a lot, but I do not want new technologies that make tenkara too easy. If you could catch many fish easily with new equipment, I would not think it very fun. I think it is interesting to improve your technique and skill under limited conditions. Adam: I have found that the more things change, the more they remain the same. I understand that is quite a blanket statement but I do find a lot of truth in it. In what ever I enjoy, I always research the history of it. 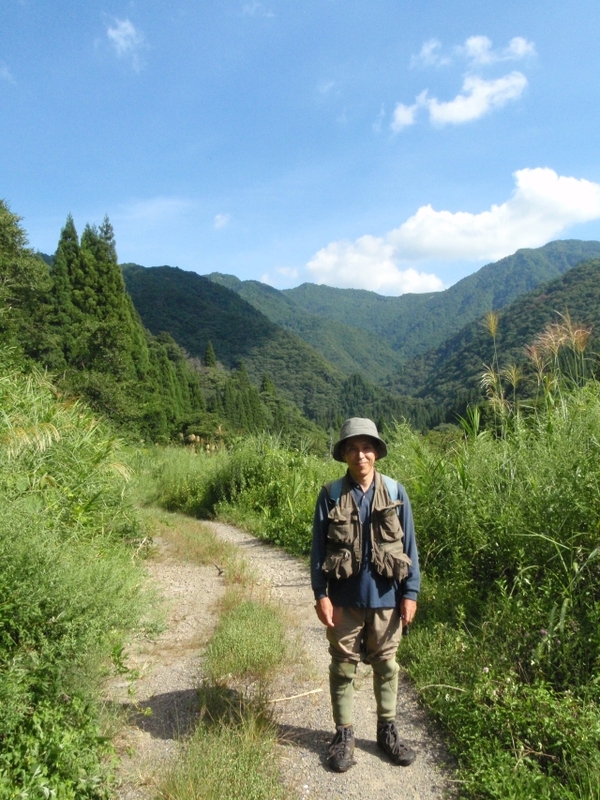 I also understand that you know a gentlemen that knows a lot about the history of tenkara in Japan. Again, I would very much enjoy his participation here or a story of his knowledge about those who have been in the early days of tenkara. 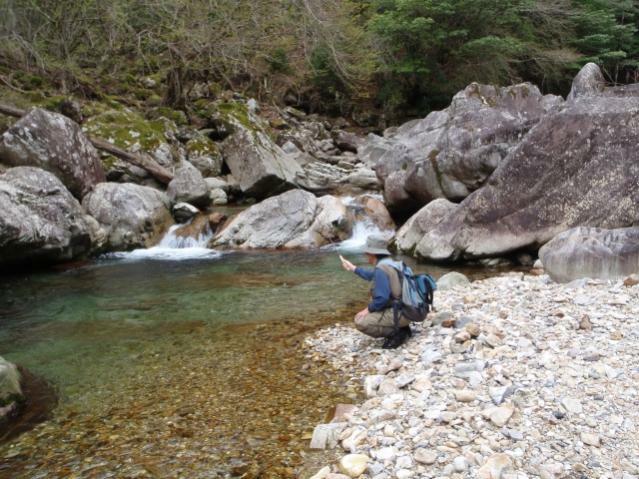 Can you tell us a little bit about what you know of on the early days of tenkara? Eddie: I have a good article of a fishing magazine that can answer your question. It was written by Yamamoto Soseki who is well known as a tenkara fisher who introduced modern tenkara to mountain-stream-fish anglers by books and magazines. In that article, Soseki briefly described the history of his tenkara and some tenkara techniques in different districts in Japan. I summarize that article and arranged a report for you. Adam: I have very much enjoyed this interview with you Eddie. I would like to give you the opportunity to say anything that you want for our readers here. Eddie: I hope the participants of this forum to share their experiences, ideas, and techniques with us to improve our tenkara techniques and enrich our fishing lives.